Former Indian skipper MS Dhoni is a vital part of team India, Dhoni keeps advising bowlers from behind the stumps. He has done this with Kuldeep Yadav, Yuzvendra Chahal, Ravindra Jadeja before and now he did it with Kedar Jadhav. 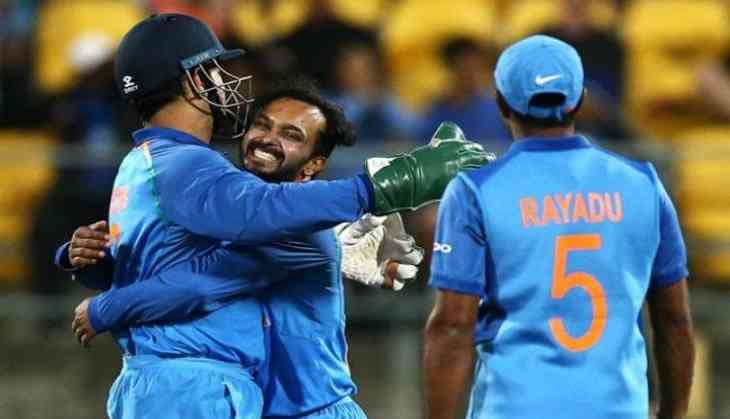 The Indian spinner Kedar Jadhav took to his Twitter handle to reveal that it came to him as real surprise when MS Dhoni advised him in Marathi during fifth ODI against New Zealand. “Pudhe nako bhau...gheun taak (Don’t bowl full...get him),” Dhoni was heard telling Jadhav from behind the stumps. Kedar Jadhav while praising Dhoni’s Marathi speaking skills wrote on his Twitter account, “You always feel at home on foreign tours when @msdhoni is behind the stumps.” Dhoni is also known for his command over multiple languages. Recently, in video shared online by Sakshi Dhoni, he was seen speaking in Bhojpuri with daughter Ziva.